William L Price's 1904 piece, "The Building of a Chair"
-- reprinted below from The Artsman 1, no 8 March 1904 (scroll down) -- articulates a sentiment that, today, is labeled "anti-modern". This sentiment betrays an anti-machine mentality that prevailed among many followers of the Arts and Crafts movement. A great deal of attention has been paid of late years to the making of furniture to meet the constantly increasing demands for articles that combine artistic qualities with those of general excellence. Astonishingly good reproductions of old models are being turned out every day by the large factories, while many small workshops carried on by individuals and small communities of workmen are producing good furniture without the aid of machinery. "In the furniture of our forefathers, which was good enough to last, the wood was picked not for its ease in working, but for toughness first and then for beauty of grain. In contrast with this, the commercial furniture maker, not builder of to-day, must select the easily worked straight-grained uninteresting wood for his machines, without which he is lost, and he must veneer it to get beauty of grain. He takes no account of the accidental beauty spot, or curl, or knot, which the true artsman so fondly handles and subdues to his purpose." Wisely enough, these furniture builders have gone back to ancient forms for their models; and, having selected good, strong designs, construct them on solid principles. 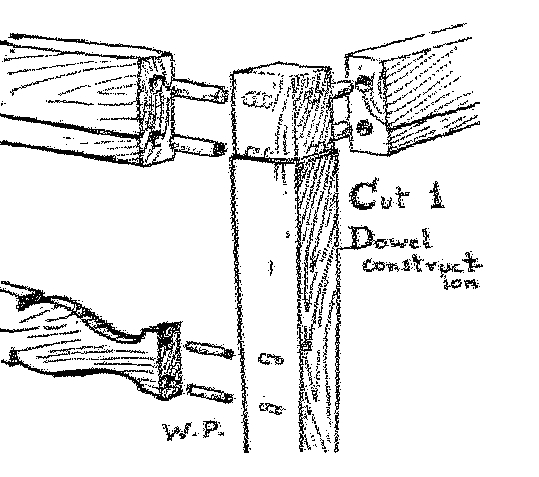 The table in our illustration, Fig.10 is mortised, tenoned, pegged and glued and the two ends joined together by loose wedge joints, as a glance will show. The chairs are also solidly built, and are properly pegged and joined together. Fig. i represents an eight-legged table of the variety popularly known to-day as the "thousand-legged table." 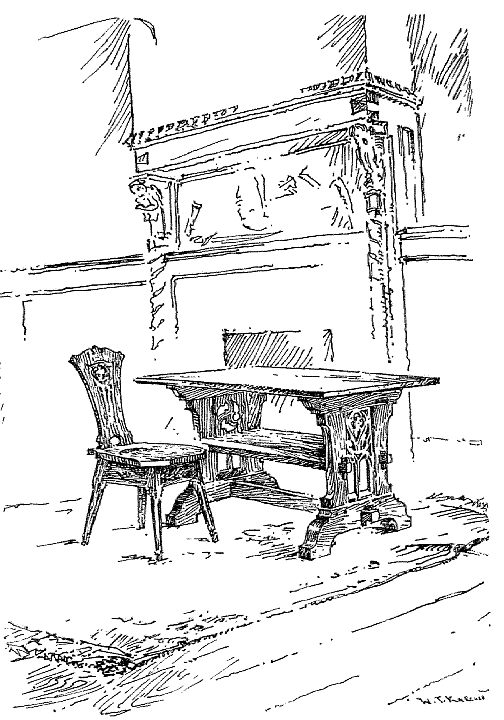 In old inventories it is referred to as "oval table," or "folding table," or "table that folds up." It has four stationary legs joined by stretchers and four movable legs that when pulled forward form a support to the drop leaf. As a rule, this table was made in oak and was small in size. The style remained long in fashion. A superb example of mahogany which belonged to Sir William Johnson and which was confiscated in 1776, is now in the Albany Institute and Historical and Art Society. This beautiful table is six feet six inches long, and the frame that moves to support the leaf consists of three legs, making ten legs in all. Figs. 5, 7, 9 and 10 are suggested by models of an earlier period. Fig. 5 is a Gothic table, the end supports of which are carved and pierced with Gothic tracery. This is a large strong table suitable for a library or a side table in a dining-room. A wine-cooler, a vase of flowers, or a handsome piece of porcelain could be placed on the bottom shelf. Source: Esther Singleton, "Furniture for the Home", American Homes and Gardens 7 April, 1910, pages 136-137. William L Price "The Building of a Chair"
What do you mean by building a chair? What is the difference between a chair that is built and any other chair, and why should one pay more for it than for any other? The difference is between good work and bad work—not good technique, but good work. The chair that is not built may be as beautiful in design and in carving. The joints may be even tighter. The surface of the varnish or shellac more highly polished. But the chair is not therefore a good chair. It is good for trade, or what we have substituted for trade, but it is good for neither maker nor buyer. The table in ... Fig.10 [above] is mortised, tenoned, pegged and glued and the two ends joined together by loose wedge joints, as a glance will show. The chairs are also solidly built, and are properly pegged and joined together. There is no mystery about the built chair — only common sense. Let us see if we cannot invest not only chairs but all wood work with a new interest, and raise the consideration of it above the question of its marketable qualities. Since most furniture is built in the main of wood let us consider wood a moment. In the furniture of our forefathers, which was good enough to last, you will find that the wood was picked not for its ease in working, but for toughness first, and for beauty of grain second. In contrast to this, the commercial furniture maker, not builder, of today, must select the easily worked straight grained uninteresting wood for his machines, without which he is lost, and he must veneer to get beauty of grain. He takes no account of the accidental beauty spot or curl or knot which the true artsman so lovingly fondles and subdues to his purpose. I was asking a handler of hard woods the other day as to the value of Delaware white oak, and he said he did not want it at any price. When I told him that I had heard it was the toughest and best oak to be had, he said that that was just the trouble—furniture men would not buy it. In the old days, better days at least for woodwork, the woodsman swung his axe against the tree best fitted for its future use, and with some know!- edge and care for that use. The great trunk cut to logs in the winter, when least full of sap, was floated down by stream and flume to the river and then rafted to its destination—washed and purified from sap, sawed to size, and air-dried. But the world in its haste, fired with its ambition to seat us all upon (at least imitations of) palace chairs, has ceased to care for quality in its insatiable desire for quantity. And so the trees give up their life to be rushed from log to machine, via the dry kiln, thereby losing much of its toughness and elasticity. And this economy is deforesting the country that we may fill our houses with woodwork and furniture destined in a few years to the scrap-heap. Remember that it takes no more wood to make a chair that will last a century than one that will last perhaps a decade. And because chairs are cheap we must have so many. "Necessity is the mother of invention" Yes, but also, alas, invention is the mother of necessity. And others beside bargain counter fiends, if all our market be not a bargain counter, clutter up their homes with the insistent product of "invention." But to build our chair — the wood selected, air-dried, if possible, and the run of the grain for strength well considered — what next? Let us look into the secrets of the commercial chair, fair as it is to sight. and touch. Find one that is loose in its joints — no uncommon thing. Having pulled it apart this is what you find: dowels, dowels, nothing but dowels — that is in the reputedly good furniture; in the other you may find nails [see cut one]. Now a dowel looks strong, is strong, and is so easy just a couple of holes to bore in legs and brace, a couple of little round pins, and a dash of glue; just a little varnish or it all; and there is your finished joint. But don't forget the varnish, for, if you do, a few weeks or at most months of hot and cold, wet and dry, with which bountiful nature so lavishly furnishes us, will see your joint resolve itself into leg and brace and dowels once again. If it were not for the varnish to keep the damp out the furniture warehouses would have to keep a furniture gluer on the premises as the hotels do. And now cheap glue and varnish make it necessary to supplant the glue pot with hammer and nails. strength of the dowel joint is the strength of the glue and no more. 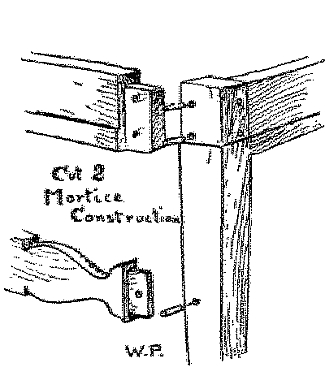 solid of the brace, [see cut two] and a corresponding hole or mortise in the leg, and when leg and brace are joined, holes are bored through mortised and tenoned joint and pinned. All the glue has to do is to hold the pin in place, and your joint is there to stay, barring accident, as long as the wood lasts, regardless of varnish or change of weather. 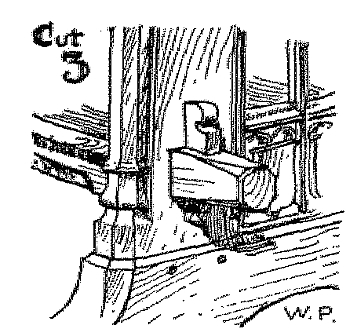 Then there is the tenon and the wedge joint used properly only when the joint is to be a loose joint and to be actually taken apart [see cut three]. "Yes, provided the furniture is so designed that it can be properly built, tenoned and with no mixed construction." This does not mean that several sorts of joints may not properly he used in one piece of furniture, but that they must not conflict. 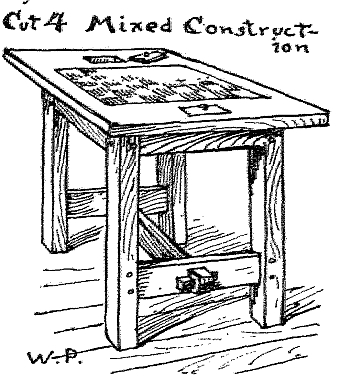 The ends of a table, for instance, can be properly framed up, mortised, tenoned and pegged and glued, and the two ends joined together, by loose wedge joints. In illustration of this the reader is referred to the frontispiece in this issue of The Artsman. And even the dowel, or, better yet, the loose tenon, may be and is used very properly in glued joints like in the tops of tables, where there is no lateral strain on the joint. It costs energy and ingenuity and patience and skill to do all this; yes, and it builds these virtues as well. But it costs money to employ these talents — and why not? We pay for skill in the doctor, in the lawyer, in the business man, without grudging it, and their sole purpose in life is to keep us alive and gain for us the possession of these things. Not that the possession of things is the end of life, but all skill is employed to secure such things. But we are not done with the question of our good chair. We might worry along in a world of sham chairs as long as the forests hold out. We might put up with the annoyances of poor glue and adulterated foods. But we can't go on or even stay where we are with a community of sham makers. We can't get character as a by-product of the shoddy mill. We can't build a state any better than its component parts, and we can't build chairs or do any other honest work, requiring skill and initiative, without building honesty, skill and initiative into our characters. So your built chair is something more than a good chair. It is a message of honesty and joy to the possessor, and a cause of growth and of joy to the worker. And your "made-up" chair is something less than the sham that it stands for, insidiously and in the guise of a blessing undoing the character alike of maker and possessor. It and its kindred shams are the symptoms of that loosening of character that is reflected in the hideous political and industrial corruption that Lincoln Steffens has shown is at work undermining our social and political fabric. 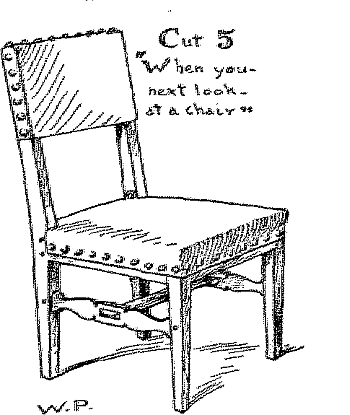 When you next look at a chair [see cut five], look below the varnish, and if you can't find the pins of honest construction, shun it as you would the evil one of which it is a product. Very few people would express any doubt of the principle we have been at such pains to illustrate. When we make an argument like the present they are liable to concede that it is good logic and implies honest mechanism. But then they think of conditions as they are, of the temptations and seeming necessities that pass the other way, and ask: What's the use? It's of every use and not only in building furniture. Go look at your own work and apply the principle there. And if you find it involves pretense, or if it means to you or your employer the kind of work that stunts and dwarfs, there is no sacrifice that you can make in changing it that won't pay.